I painted “Wishes” to describe the intricate lifelong relationship between sisters. It can be an incredibly complex relationship, filled with friendship, imagination, hope. My own sister is 8 years older than I. I tagged along with her everywhere she went. Being raised on a farm provided many opportunities for imaginative play and adventure. In my eyes, we were not only best friends right then, but would be for life. 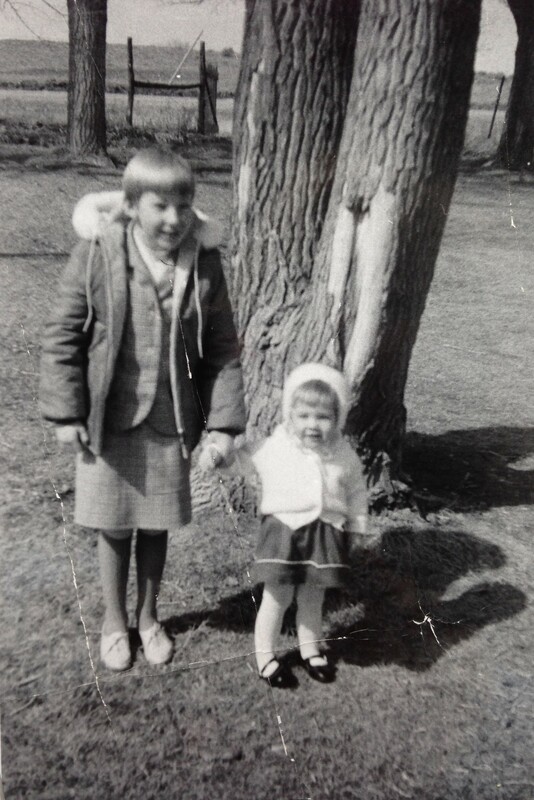 My sister and I in our Sunday Best on the Colorado farm. We spend all day together on our farm. Whether doing chores, riding bikes, playing, fixing something, or working with the animals, we were joined at the hip dawn to dusk. Even though she was so much older than I, she tolerated, and even seemed to enjoy, our time together. I treasured her and looked up to her for guidance and adventure. When she left to go to college, then married and moved away during my pre-teen years, I felt as though a chunk of my body left as well. She had children and a husband and a different life. Our connection dwindled down to occasional visits, maybe once or twice a year, and even those visits didn’t manage to fill the void in my chest. During a visit to Willamette Valley this spring, I happened upon a dynamic scene of two girls with their mother, out for a stroll at the tulip farm. During the outing, an older girl bounded up to a bench among brilliantly lit tulips. The younger girl, not wanting to be left out, skipped to the bench to see what amazing ideas her sister had discovered. Conversation, planning, and imagination between them led to some secret world only they were privy to. It reminded me of my sister and I and our childhood. 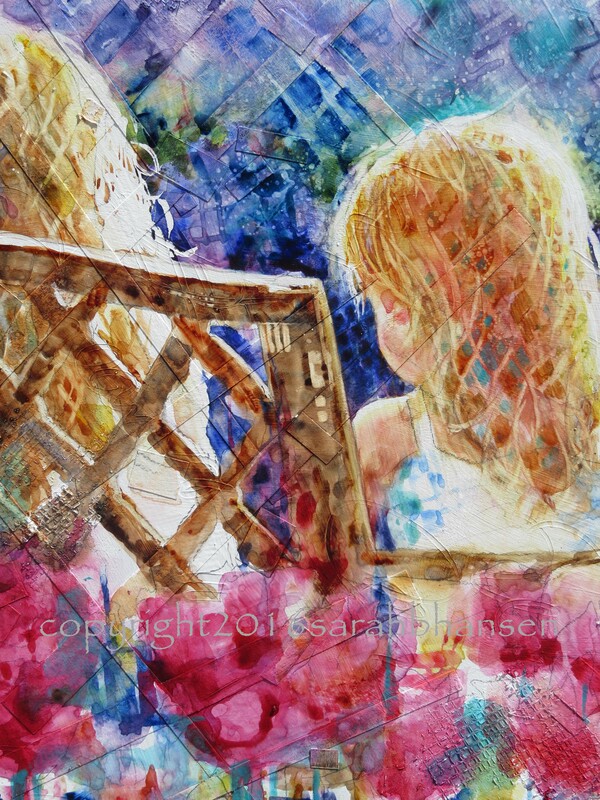 In painting the girls, I wanted to impart the magic of imagination, play, and friendship between these two girls, but I also wanted to impart a wistful feel. I placed lighting at late afternoon, haloing their hair in a beautiful way, but also suggesting the end of the day. Their time is ending. Not only for the day, but some time in the future when they will no longer be together. They will have separate lives, separate families, and perhaps live far apart. That very close, magical friendship and companionship will change. It might become richer and deeper as time goes on, or life, death and circumstances might wedge between them in a way that keeps them apart. 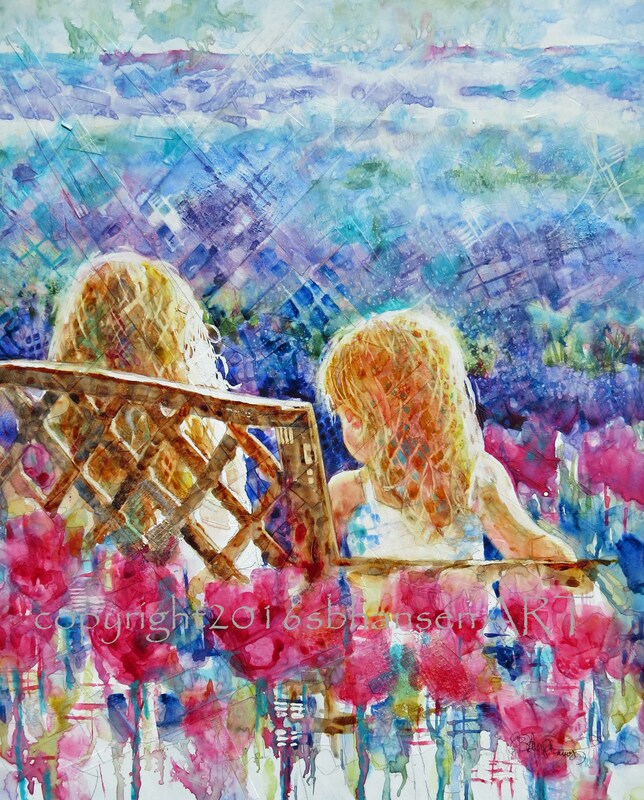 The title, “Wishes”, conveys the bittersweet moments in which I wish for my sister and our companionship we once had. Whether it is your own sister, your children, nieces, grandchildren, or even a life-long friend you call a sister, take time today to call them if you can and remind them that they are important in your life and that you cherish every moment. Remember the fun times you had together as children. Reconnect and renew your friendship. And for this, I say to my own sister, thank you for the magic. And I love you. “Wishes” is available at Tumalo Art Company in Bend, Oregon. When you go to see it, make sure to notice the repeating pattern of bench latticework in the collaged paper and gridded texture of the gesso. Notice, too, a dreamlike state of the sky and fields at the top of the painting and the suggestion of distant trees. Tulips in the front are dripping color and left to the imagination, further enhancing a magic feel. This is very touching, Sarah. And a good explanation of this wonderful painting! Hi beautiful! I’m so happy you liked the post! I agree. Let’s connect more often, as much as we can. Love you!